Celebrate the culture of skateboarding. From 22nd – 26th of February 2012, the shores of Bondi Beach, Sydney will play host to VANS BOWL-A-RAMA™ not only the biggest professional concrete event in the Southern Hemisphere, but also the biggest week of skateboarding infused cultural festivities in Australia. 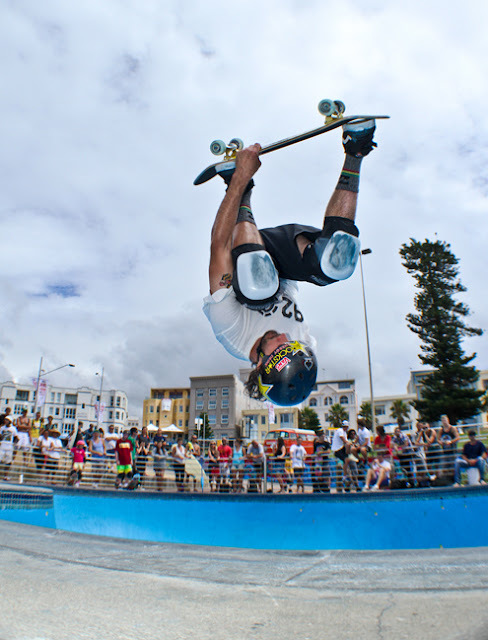 Attracting legendary skateboarder Steve Caballero – returning to defend his 5th title, Bucky Lasek and Australian pro’s Corbin Harris and Renton Millar 2012 will be bigger than ever! In it’s eighth year, the event boasts a four day line up of skateboarding infused cultural activities in the lead up to the competition on Saturday 25th of February in which crowds will witness the most impressive line up of skate talent battle it out for an overall prize pool of $80,000 – the biggest prize pool yet. “We’re thrilled to be able to announce a 25% increase in the overall prize purse this year,” comments Co-Founder, skatepark designer, and skater Chad Ford. “It’s something we will try and continue to do every year in order to look after and foster the talent within this growing sport,” he adds. Heralded by the World Cup of Skateboarding (WCS), the official sanctioning partner of global skateboarding events; as “an event that is at the pinnacle of celebrating the culture of skateboarding in Australia,” comments Don Bostilk, WCS President, BOWL-A-RAMA™ 2012 will bring with it the greatest cross generational gathering of international skaters at any one time in the history of Australian skateboarding. The rostered week of events includes a week of parties, art shows, music and entertainment. Broadcast live online and via television, Australian and International fans can tune into the action and experience the excitement and atmosphere if they can’t physically make it on the day. The broadcast will include a range of live interviews with an array of the infamous skateboarders and international talent. Professional Australian skateboarder and T.V personality Corbin Harris claims, “It’s one of the best competitions I’ve ever been a part of. The riders, the backdrop of Bondi Beach and the week of cultural side of events is second to none, I’m stoked to be part of the family again this year!” He Adds. Save the date for this year’s biggest BOWL-A-RAMA™ ever and become part of the family!